_The earth’s temperature in our location in Nebraska is approximately 57 degrees year round. And geo-thermal systems make use of this temperature in heating and cooling your home. The earth is like a radiator and the loop that is placed in the ground is like the core of your car radiator. The hole is drilled in the ground to the depth of 200 feet and then a PEP tube is place into the hole and brought back to the surface. The number of loops needed is determined by one per ton of heating or air conditioning required. The loops are tied together at the header under the surface (approximately 5 feet underground) and run into the unit. They are then filled with water and a special type of anti-freeze, a circulating pump located in the unit moves the fluid through the loops to facilitate heating or cooling according to the season or what the unit calls for. 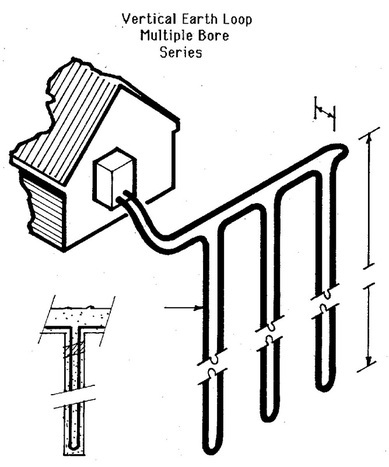 In the summer the unit removes heat from the house and circulates it through the earth to cool the temperature and in the winter the process is reversed. The advantage for the use of a Geo-Thermal system is the constant temperature in the earth.